Hey Ya’ll! Do your kids love to learn by playing games? 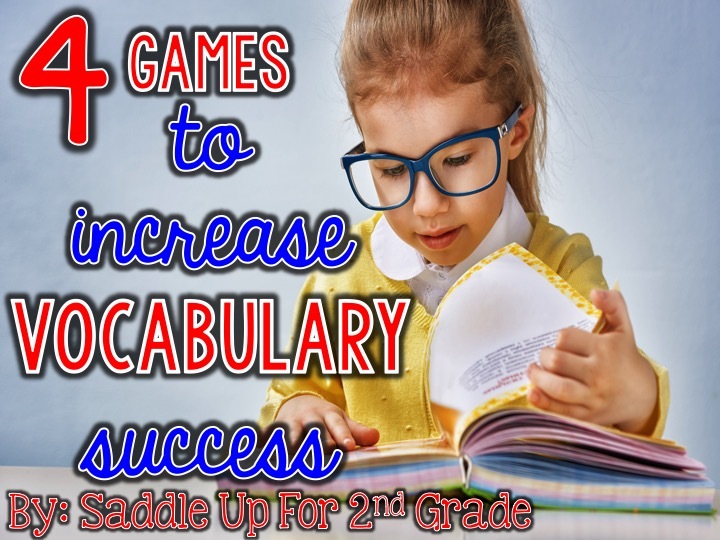 What if I told you that you could increase your students vocabulary by playing games that take 20 minutes or less? Vocabulary is something that is highly stressed in my district. It seems like each year, more and more pressure is put on us to increase students vocabulary. Today I’m here to share with you 4 easy games that you can implement into your class to increase vocabulary and make learning fun AND engaging! Kids should get excited about learning. Implementing games into our daily routine helps increase their learning when they don’t even know it. 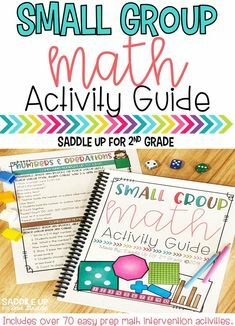 All of these activities that I’m about to share can be used in a whole or small group setting. 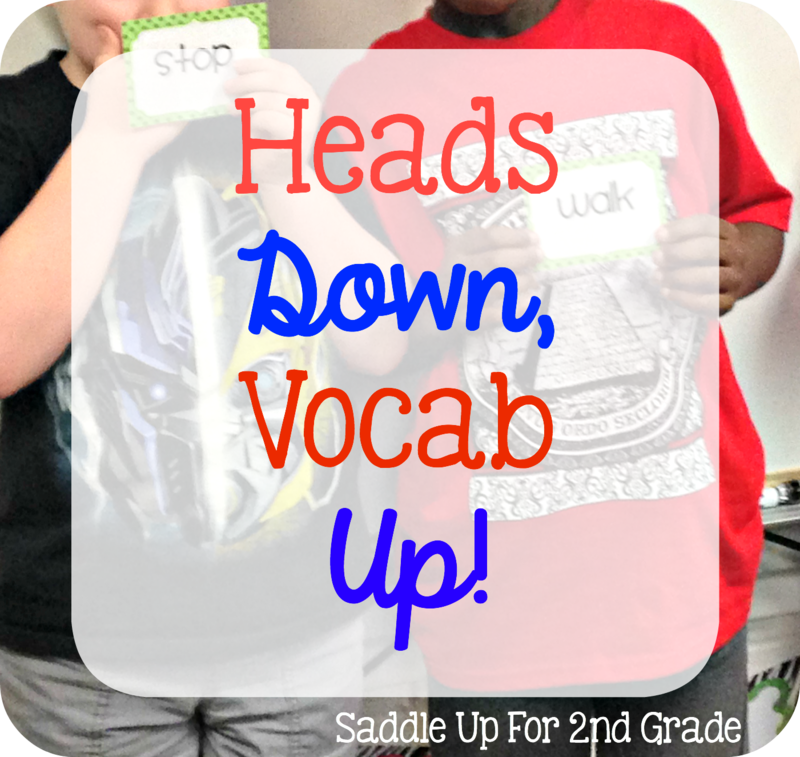 First up is Heads Down, Vocab Up! 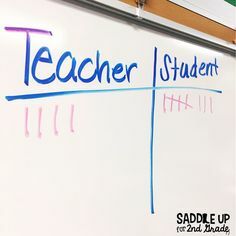 Pick 3-4 students to be it. 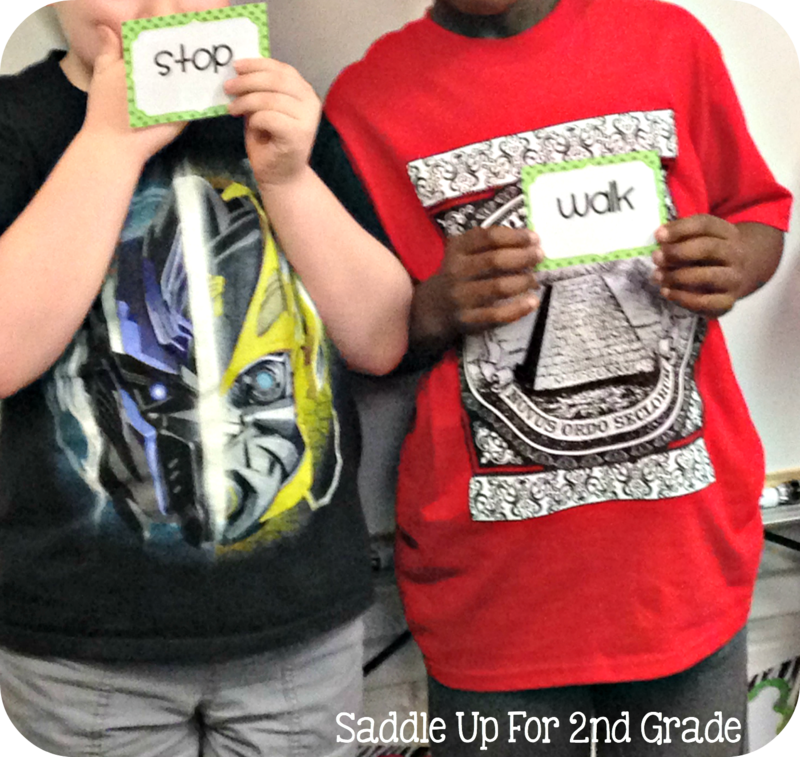 Give each student picked a vocabulary card. Turn off the lights and the rest of the class puts their head down (NO PEEKING!) and their thumb up. The students chosen go around the room and pick someone by touching their thumb. When the teacher turns the lights on, those picked stand up and try to guess who picked them. Rather than calling out the students name, they must call out the vocabulary word that student is holding. If they get it right, they get to trade places and be it. If they get it wrong, they sit back down. Then the next round begins. You can also have your students tell the meaning of the word, use it in a sentence or give a synonym. This way it can be easily differentiated for various learners. 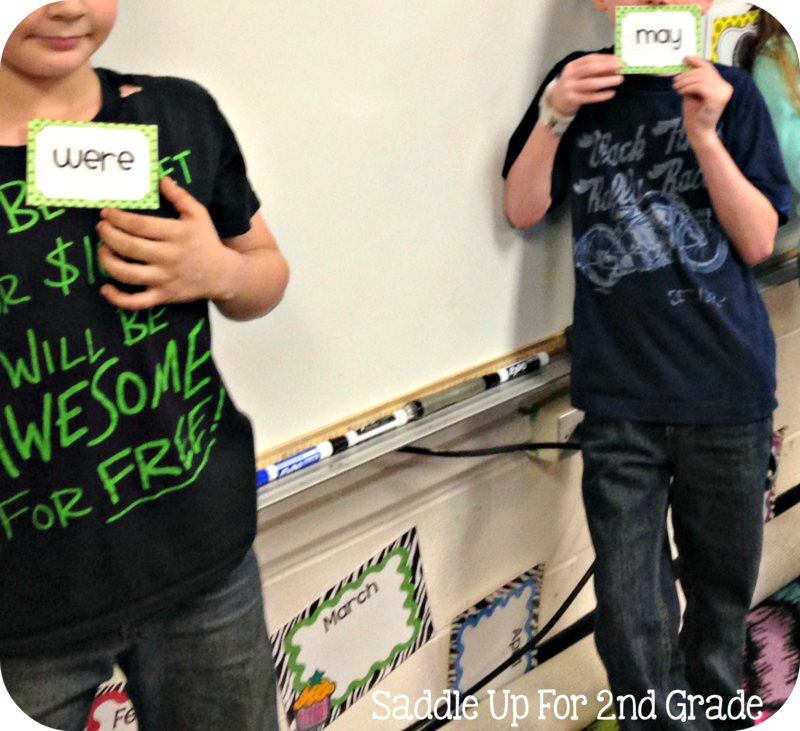 When using academic vocabulary cards, I like have them say the word and their own meaning of the word. 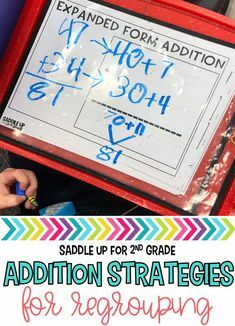 This is a simple review that can be done in 5 minutes or stretched out into a whole group lesson. Up next is a little game I like to call Word Speed! 2. 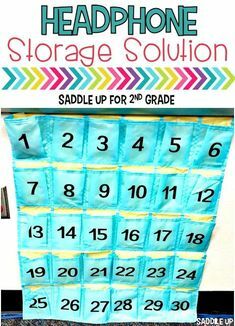 Tape a piece of chart paper on opposite sides of the room for each team. You want them far enough apart where the other team can’t see the others paper. 3. Write the topic you are covering at the top of the chart paper. 4. Time them for 1-2 minutes (sometimes this will be longer such as 3-4 minutes until everyone has a turn, but they think they only have one minute). 6. They have 1-2 minutes to write as many words as they can. 7. When the time is up, the person holding the marker brings it to you. 8. I give each team one point for having the correct words. They race every day. On Monday-Wednesday, I do not count off for spelling. On Thursday and Friday, if a word is misspelled, I do not count it. This helps with preventing tie-breakers. 9. At the end of the week, the team with most points is the Word Speed Champ for the week! 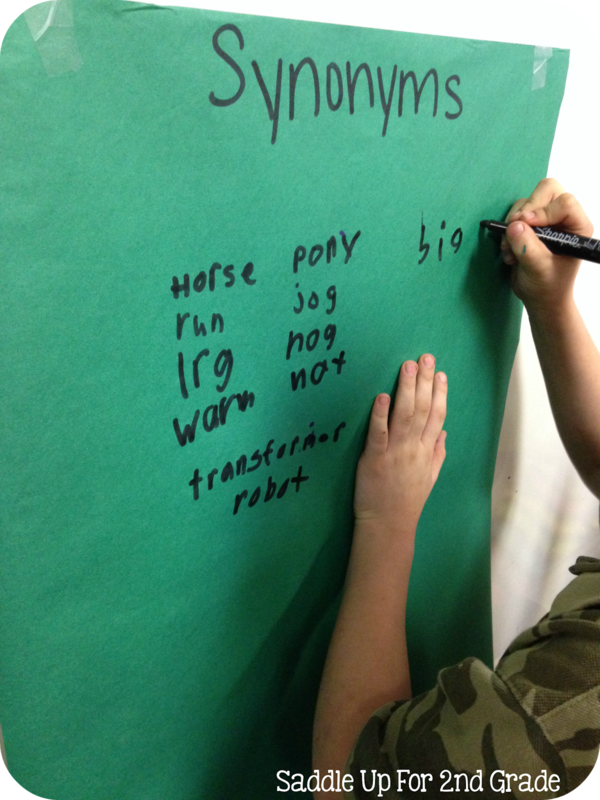 We play with a new piece of paper everyday so that they are able to use the same words. On Tuesday, I use the back of the page that they wrote on, on Monday. I kept a tally of the points on the board. I found that they loved this game so much, that they would go home and ask their families for words to use. 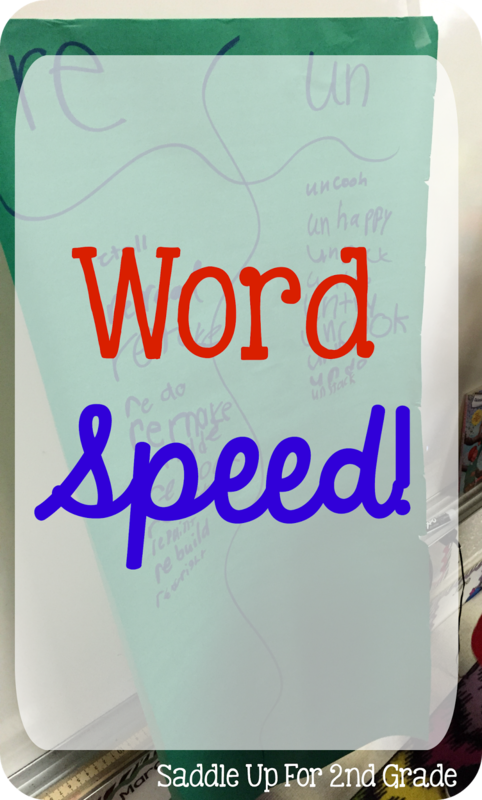 Once the kids got into the routine of playing for various concepts, they would always ask if it was Word Speed time! Now lets talk about a class favorite that I use for multiple concepts. This little game is a BIG DEAL! It’s called KABOOM! I blogged about this concept awhile back. You can read about it here. I’ll do a quick recap. Color one tip of each popsicle stick. This end sticks out of the cup. 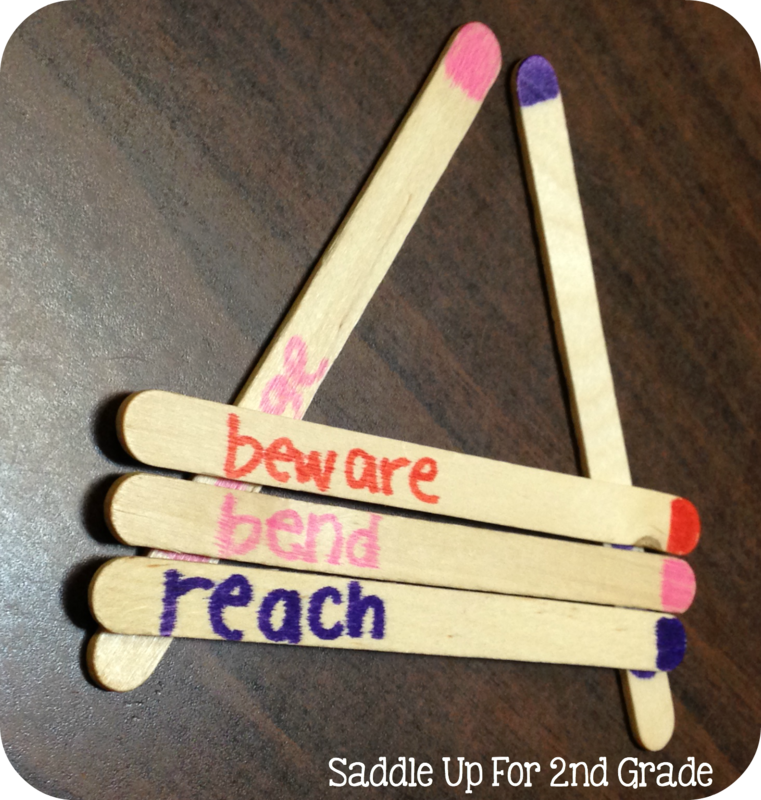 Write a vocabulary word on each stick. You also need 5-10 KABOOM sticks. (For my academic vocabulary sets, I put 2 sets of vocabulary words that are 8 words each, and then 5 Kaboom! sticks. For sight words, I do a full set and then 10 KABOOM sticks. 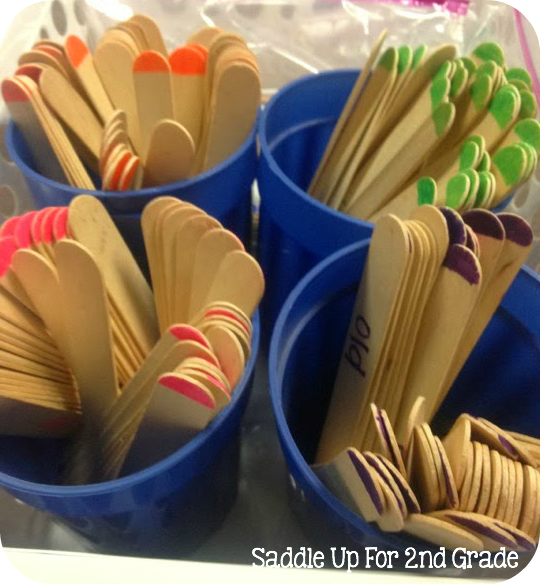 Place all the sticks in a cup with the colored tip sticking up. Students play rock, paper, scissors to see who goes first. The first player draws a stick and reads the word. For academic vocabulary they must read the word correctly and tell the meaning or use it in a sentence. This is good for differentiation in your groups. If the student reads the word and uses it in correctly they get to keep their stick. If they read it incorrectly or use it incorrectly, the stick must go back in the cup. If they draw a stick that says KABOOM! They have to put all of their sticks back into the cup. This is a BIG DEAL ya’ll! The player with the most sticks at the end of the game wins! 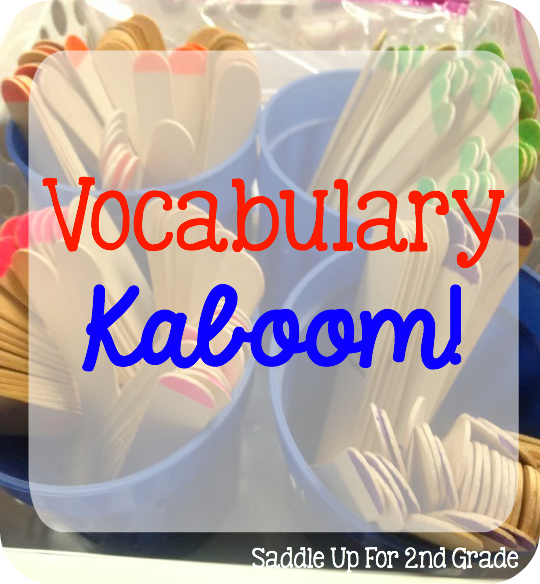 I like to play KABOOM with academic vocabulary at the beginning of each small group. I can easily differentiate each question I ask based on each student to fit their needs. We also play whole group using sight words, parts of speech, and for various math concepts. This is a favorite during stations as well. I keep all of my games set up in baskets and the kids can easily grab a cup when they have time. All the other games I have created are stored and labeled in ziploc bags. 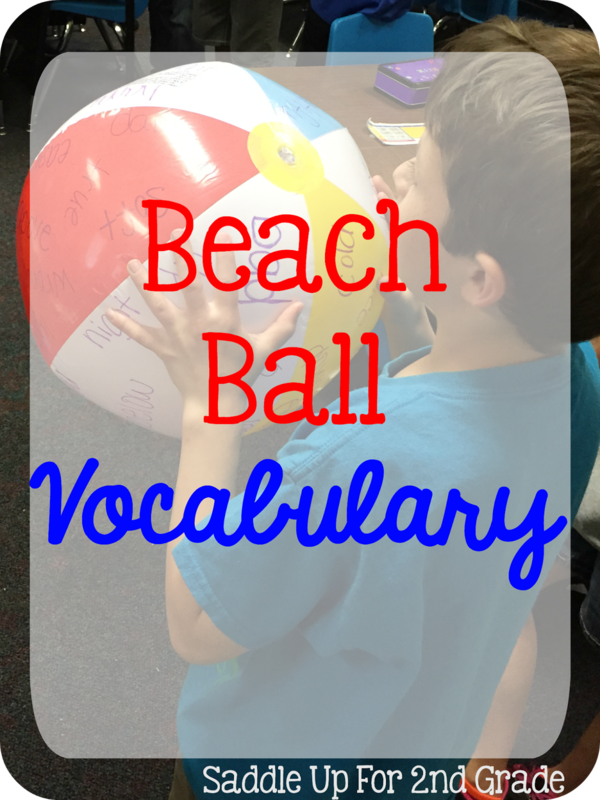 Last but most certainly not least is my personal favorite, Beach Ball Vocabulary! 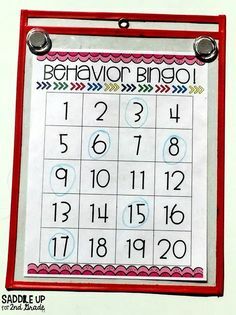 I originally started playing this game with math facts and learned that I could use it for all different subjects. You can read my math fact post here. All you need is a beach ball and a maker. 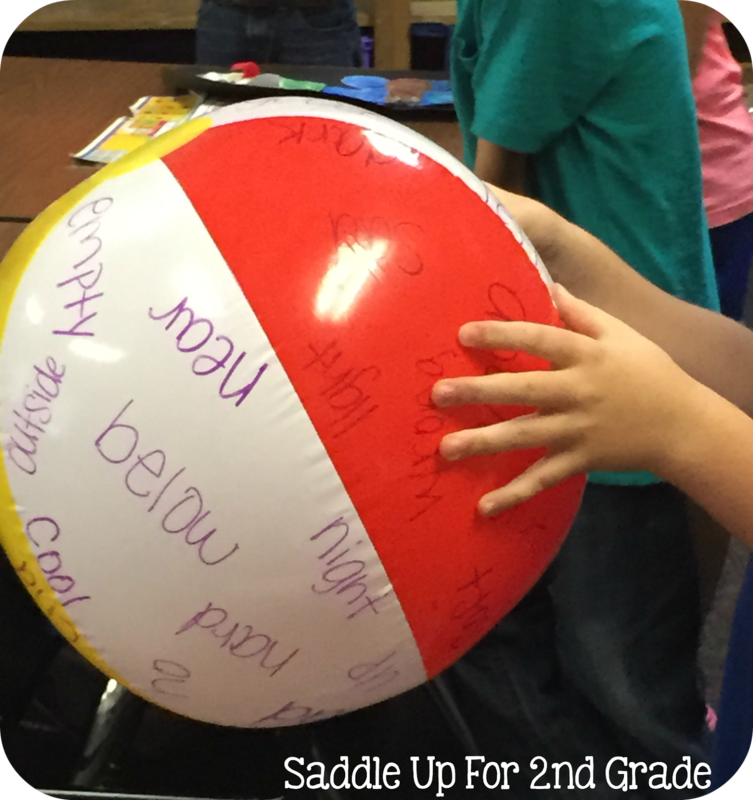 Write vocabulary words all over the ball in a random order. Have students form a large circle around the room while you or another student stands in the middle. 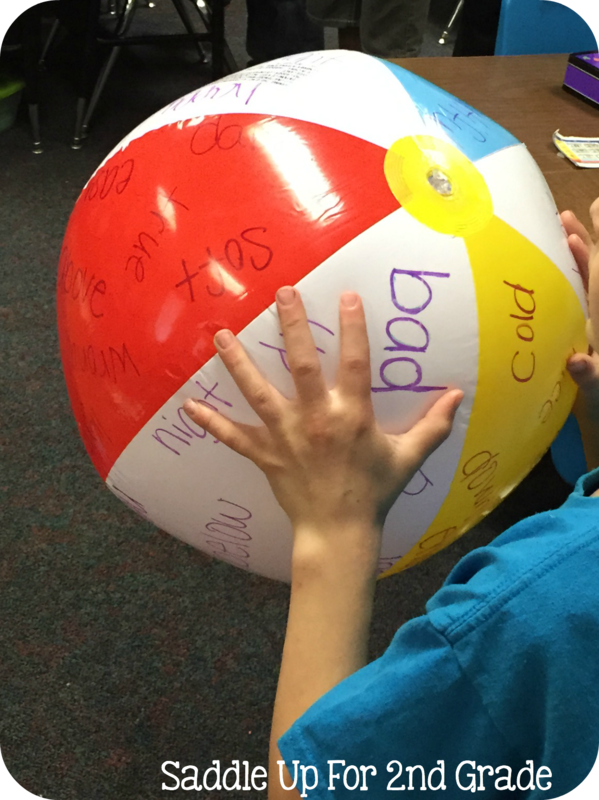 GENTLY toss the beach ball to a student. Whatever word their thumb (you can pick right or left) lands on, they must tell the definition, use it in a sentence, or give an example of. Then they GENTLY toss the ball back to you and you throw it to another student. The example shown above was played with antonyms. Students had to say the antonym of the word one of their thumbs landed on. For academic vocabulary, I have all of unit 1 words written on a ball, all of unit 2 words written on a ball, etc. 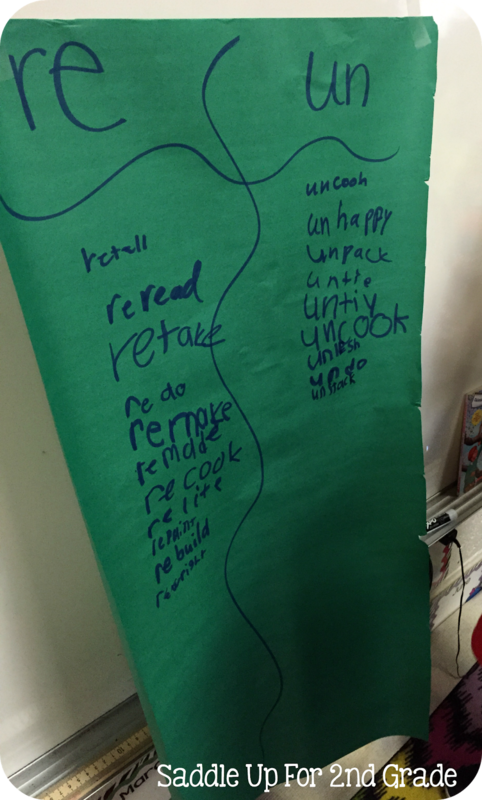 This way they are getting review of words we have already learned. All of the games show above can be used with multiple concepts such as academic vocabulary, synonyms/antonyms, prefixes/suffixes, compound words, contractions, parts of speech, sight words and so much more. 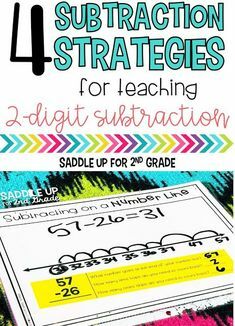 Use them cross-curricular for math concepts or science and social studies. I hope you can incorporate at least one of these activities into your classroom! My kids love them and I hope yours do too! Have a great day!